Composer is a popular dependency management tool for PHP, created mainly to facilitate installation and updates for project dependencies. It will check which other packages a specific project depends on and install them for you, using the appropriate versions according to the project requirements. This tutorial will show how to install and get started with Composer on an Ubuntu 14.04 server. Before we download and install Composer, we need to make sure our server has all dependencies installed. You can now proceed to the next step. This means Composer was succesfully installed on your system. If you prefer to have separate Composer executables for each project you might host on this server, you can simply install it locally, on a per-project basis. This method is also useful when your system user doesn't have permission to install software system-wide. In this case, installation can be done with curl -sS https://getcomposer.org/installer | php - this will generate a composer.phar file in your current directory, which can be executed with php composer.phar [command]. In order to use Composer in your project, you'll need a composer.json file. The composer.json file basically tells Composer which dependencies it needs to download for your project, and which versions of each package are allowed to be installed. This is extremelly important to keep your project consistent and avoid installing unstable versions that could potentially cause backwards compatibility issues. You don't need to create this file manually - it's easy to run into syntax errors when you do so. Composer auto-generates the composer.json file when you add a dependency to your project using the require command. Additional dependencies can also be added in the same way, without the need to manually edit this file. We'll see how this works in practice with a simple demo application. The goal of this application is to transform a given sentence into a URL-friendly string - a slug. This is commonly used to convert page titles to URL paths (like the final portion of the URL for this tutorial). You'll see two numbers on the right side of each package in the list. The number on the top represents how many times the package was installed, and the number on the bottom shows how many times a package was starred on GitHub. You can reorder the search results based on these numbers (look for the two icons on the right side of the search bar). Generally speaking, packages with more installations and more stars tend to be more stable, since so many people are using them. It's also important to check the package description for relevance - is that really what you are looking for? You will notice that the packages on Packagist have a vendor name and a package name. Each package has a unique identifier (a namespace) in the same format Github uses for its repositories: vendor/package. The library we want to install uses the namespace cocur/slugify The namespace is what we need in order to require the package in our project. The composer.lock file is used to store information about which versions of each package are installed, and make sure the same versions are used if someone else clones your project and installs its dependencies. The vendor directory is where the project dependencies are located. The vendor folder should not be committed into version control - you only need to include the composer.json and composer.lock files. When installing a project that already contains a composer.json file, you need to run composer install in order to download the project's dependencies. You might notice the special character ^ before the version number on composer.json. Composer supports several different constraints and formats for defining the required package version, in order to provide flexibility while also keeping your project stable. The caret (^) operator used by the auto-generated composer.json file is the recommended operator for maximum interoperability, following semantic versioning. In this case, it defines 1.3 as the minimum compatible version, and allows updates to any future version below 2.0. Generally speaking, you won't need to tamper with version constraints in your composer.json file. However, some situations might require that you manually edit the constraints - for instance, when a major new version of your required library is released and you want to upgrade, or when the library you want to use doesn't follow semantic versioning. For a more in-depth view of Composer version constraints, check their official documentation. Composer also provides an autoload script that you can include in your project to get autoloading for free. This makes it much easier to work with your dependencies and define your own namespaces. The only thing you need to do is include the vendor/autoload.php file in your PHP scripts, before any class instantiation. This should produce the output hello-world-this-is-a-long-sentence-and-i-need-to-make-a-slug-from-it. This will check for newer versions of the libraries you required in your project. If a newer version is found and it's compatible with the version constraint defined in the composer.json file, it will replace the previous version installed. The composer.lock file will be updated to reflect these changes. 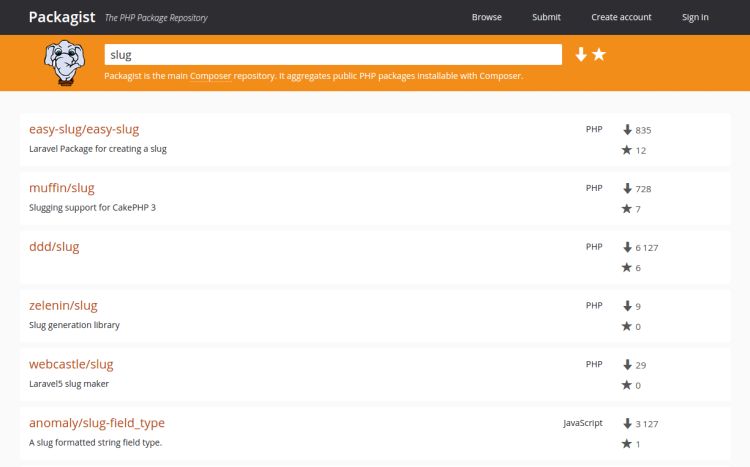 Composer is a powerful tool every PHP developer should have in their utility belt. Beyond providing an easy and reliable way for managing project dependencies, it also establishes a new de facto standard for sharing and discovering PHP packages created by the community. This tutorial covered the essentials for getting started with Composer on Ubuntu 14.04.